KATHMANDU: Contractors have completed only 12 percent of the reconstruction work assigned to them at schools affected by the 2015 earthquake in 31 districts. A total of 532 schools were contracted out to them for reconstruction. According to the Ministry of Education, Science and Technology (MoEST), a total of 7,553 schools in the 31 districts were damaged by earthquake . The reconstruction of 6,530 schools is ongoing while the government is yet to begin reconstruction of 217 of the schools. The records of the Central Project Implementation Unit (CPIU) at the ministry show that 4,190 schools have already been reconstructed while reconstruction at 1,963 schools is ongoing. “The selection process for the reconstruction of 377 schools has been completed,” said Joint-Secretary Ima Narayan Shrestha, chief of the CIPU. “The process of reconstruction of 217 schools is yet to begin,” he added. According to the CPIU, nearly four dozen contractors were selected to reconstruct 532 schools in different districts. Out of the 532 schools, the contractors have completed reconstruction of only 64 while reconstruction of 314 others is underway. “The selection of 154 schools for reconstruction by the contractors was recently completed,” said CPIU officials. Roshan Dahal, general secretary of the Federation of Contractor Associations of Nepal (FCAN), said the major problem in the reconstruction was the transportation of construction materials . “Another problem is assignment of reconstruction in groups of schools . There are groups of 12 to 14 schools. If the schools were reconstructed individually, the progress would have been better ,” he added. However, Dahal didn't mention any negligence by contractors . The school reconstructions are taking place under the school management committees, contractors and I/NGOs. 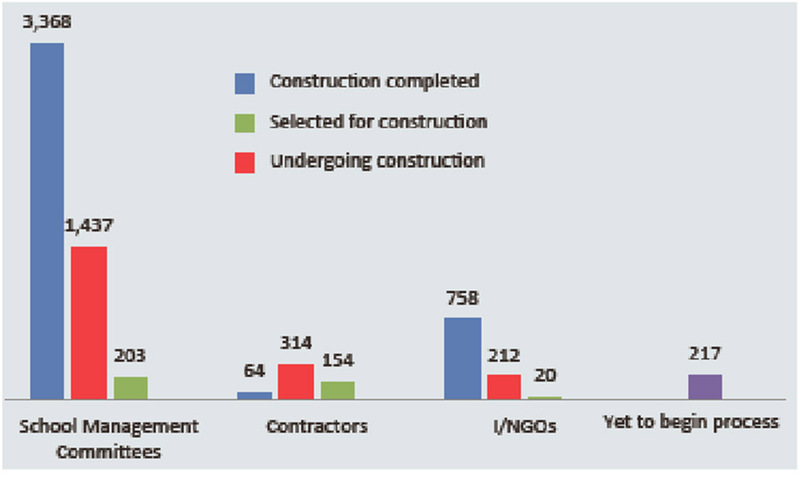 The performance of the school management committees and I/NGOs was far better than that of the contractors, according to CPIU records. The school management committees have taken on responsibility for the reconstruction of 5,008 schools. They have made a commitment to reconstruct 6,000 schools at a cost of Rs 15 billion. Of these schools, reconstruction of 3,368 has been completed and reconstruction of another 1,437 is ongoing. Similarly, 203 schools have been selected for reconstruction under the school management committees. Likewise, out 990 schools assigned to I/NGOs for reconstruction, they have completed reconstruction of 758 , reconstruction of 212 is ongoing and selection has been completed for 20 other schools . I/NGOs had earlier pledged to reconstruct 1,500 schools . India also pledged to reconstruct 70 schools, 10 each in seven districts, at a cost of Rs 5 billion. It has begun reconstruction of eight schools, while the DPR for five schools and survey and design for 56 more are in the process of being completed, according to the CPIU. The People's Republic of China also pledged to reconstruct seven schools in four of the quake-affected districts at an estimated cost of Rs 3 billion. China has been reconstructing Durbar High School in Kathmandu while feasibility study for all the schools has been completed. Reconstruction of two schools has started. A budget shortage has also been felt although donors and development partners including ADB and JICA as well as the Nepal government have already pledged funds of Rs 86 billion. “We need an additional Rs 30 billion to complete the reconstruction of all schools,” said CPIU chief Shrestha, adding that no resources have yet been extended to 1,368 schools in the quake affected districts.